Weddinghousehold.com - Your wedding is an opportunity to show off your style and celebrate everything that makes you and your fiancé special. This can extend to your wedding registry when you discover gifts as unique as you are. Try these tips to channel your style into a registry that will surprise and delight. 1. Start with a collage for inspiration. Visualize your style with a Pinterest board or an old-school collage clipped from design magazines and home catalogs. Start by pinning anything that appeals to you, and you’ll soon notice themes and trends. You may discover you’re coveting stacks of blue dishes or dreaming of a chandelier in the bathroom. Bonus Tip: Invite your fiancé to contribute to the same board and remind him to add comments to each pin so you can keep track of the details. Make a list of what you love (Corgis, lemonade yellow, picnics), have your fiancé do the same (gadgets, cocktail parties, Mad Men), then make a list together (smoothies, travel, old books). Lists in hand, seek gifts that reflect the things you love as individuals and as a couple. 3. Seek inspiration from sites brimming with beauty and whimsy. If chain stores aren’t your cup of tea, try sites as fun to browse as an antiques shop or craft show. Go to Etsy and search keywords that set your heart aflutter, then add your favorites to the gift registry. Smaller sites like ArtFire and DaWanda may not have registries, but they’re a bountiful source of unique ideas. Bonus Tip: Don’t forget shops your groom will dig, like Uncommon Goods, Furbish, and Muji. 4. Brainstorm gifts you’ll truly love. Sites like MyRegistry.com, SimpleRegistry, or Zola will let you register for just about anything, from wine-of-the-month clubs to restaurant gift cards to surfing lessons. Bonus Tip: Don’t be afraid to dream big. 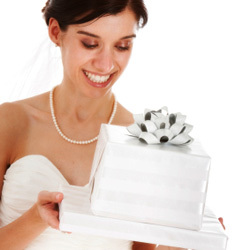 Some of these registry aggregators let multiple guests chip in together on expensive gifts. 5. Register at sites that encourage fresh ideas. At Well Registered, browse inspiration boards to discover a style that suits you, then gather gift ideas to match. Try Newlyish for style-conscious design curated by wedding-savvy tastemakers. And don’t skip the registry options at fabulous online shops like MoMA, Bottlenotes, and Seven Hopes United. Bonus Tip: Use a registry aggregator like MyRegistry, SimpleRegistry, or Zola to collect all your registries in one easy-to-manage place. 6. Seek inspiration from other brides. Stalk the wedding registries of friends, coworkers, and — why not? — celebrities. Seeing other brides’ choices can help hone your own taste. Appalled that a friend chose pink and blue towels? It’ll make you that much more confident about your all-white bathroom. Bonus Tip: Ask couples who’ve been married a while for advice. Which gifts do they regret, and which do they treasure? 0 Response to "Create a Wedding Registry With Gifts That Reflect Your Style"